Part of HNBA’s mission is to increase the number of future Latino/a legal professionals. 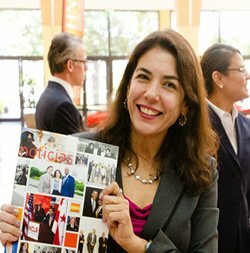 To this aim, the HNBA offers multiple educational pipeline programs and initiatives to assist in the upward mobility of the U.S. Latino population; to positively impact the quality and quantity of legal services available to Latinos; and to provide the diverse perspective and ideas that Latino/a attorneys can contribute to the legal profession and to the U.S. society as a whole. As the sole national membership organization for Latino/a attorneys, the HNBA is uniquely positioned to address the numerous and complex barriers to entry, promotion and advancement challenging current and future Latino/a attorneys. As a student volunteer, you will have access to thousands of Latino lawyers, law professors, state and federal judges, legislators, and other legal professionals able and willing to help you in the pursuit of your educational and professional goals. You can be part of the solution by volunteering you time and energy during the HNBA Annual Convention and the HNBA Corporate Counsel Conference. We ask for a minimum commitment of 10 hours in exchange for the ability to attend the continuing legal education (CLE) sessions and the convention/conference events at no charge. For more information e-mail us at cmartin@hnba.com. Since the HNBA’s founding, our volunteer leadership has worked to fulfill our Association’s multifaceted mission, including the monitoring and advancement of substantive legal issues that impact Hispanic legal professionals and the U.S. Latino population at the local, state and federal levels. Much progress has been made in over forty years; yet, more remains to be done. The work of our Association remains critical as we continue our efforts to diversify the profession and the judiciary, and as we advocate for civil rights and liberties, for access to justice and education, and for the economic development and professional advancement of Hispanics. This vital work is carried out by our volunteer members who lend their time, talent, and commitment to this important work. The HNBA’S divisions, councils, sections, committees and tasks forces include: HNBA Latina Commission, Young Lawyers Division, Law Student Division, Judicial Council, LGBT Section, Immigration Law Section, Voting Rights Section, Business Law Section, Civil Rights Section, Constitutional Law Section, Criminal Law Section, Family Law Section, Government and Administrative Law Section, Intellectual Property Law Section, International Law Section, Labor and Employment Law Section, Law Practice Management Section, Litigation and Dispute Resolution Section, and Military Law Section. As an HNBA member, we need you to be active part of our efforts. We need you to continue opening the doors of opportunity for future generations. To learn more about specific areas of interest contact HNBA Vice President of Sections and Committees, at vpsections@hnba.com and visit our Sections and Committees page.